Sample preparation can affect NSC levels in fresh forage. Pelletier et al. (2010) has shown that freezing can lead to an increase in NSC compared to samples placed directly into the dryer. "decreasing the sward height by mowing pasture decreased NSC, WSC, and ESC concentrations and subsequently decreased the postprandial insulin response of horses grazing the pasture." Presented at the 8th European Workshop for Equine Nutrition June 2016 held in France. 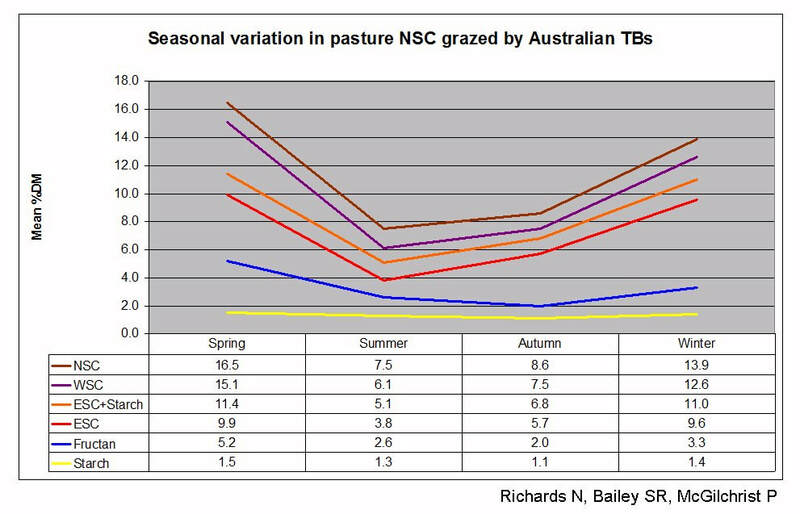 The graphs below represent mean values of 351 pasture samples collected throughout the year from Feb 2011 until Sept 2015 from 220 paddocks in the Hunter Valley, NSW, Australia, a Thoroughbred breeding area. The samples were dried and sent to Equi-Analytical, for NIR analysis. Laminitis in grazing Thoroughbred broodmares was reported to be a significant issue in this area, with the highest incidence of laminitis in the spring. The paper concludes "Of considerable interest is the fact that the only major difference between winter and spring was in the WSC content, suggesting spring pastures are significantly higher in fructan." Sugar+starch combined (hydrolyzable sugars) are greater than 10% (the limit suggested by the ECIR group) in the spring and winter - half the samples would be above the average shown in the graphs. Spring grass will be low in fibre, so horses are likely to and able to eat more. Research in cows found a correlation between volume ingested and high simple sugar levels (see Mayland et al 2000 below). In-foal mares may be subject to gestational insulin resistance. Fructan may be higher in spring than in winter, but the % of fructan is low compared to ESC, and ESC+starch. The higher incidence of laminitis in the spring is likely to be the result of increased insulin resistance due to pregnancy, combined with the high level of hydrolyzable sugar+starch and possibly increased intake of grass in its vegetative, rather than mature, stage of growth. Note that ESC appears to be the dominant influence on WSC and NSC. The grass contains far more sugar+starch than fructan at all times of the year. To try to give these levels of sugar and fructan some perspective in relation to laminitis risk, we hypothetically took the median previously laminitic (therefore insulin dysregulated) pony from research by Borer et al 2012, and put it on Richards' grass in the spring (the pasture with the highest NSC), eating 2.5% of his bodyweight per day, which should reflect some gorging on lush, sweet spring grass. Dark blue is the amount of fructan in grams he would eat per day on Richards' spring pasture - 5.2% DM x (289 kg x 2.5%). Turquoise represents the amount of inulin fructan for his bodyweight that was given in a bolus experimentally to induce laminitis in 100% of horses - 7.5 g x 298 kg. Light blue represents the amount of inulin fructan for his bodyweight that was given in a bolus experimentally to induce laminitis in 5/16 horses - 5 g x 298 kg. This is the lowest amount of fructan that has induced laminitis (in only some horses) experimentally. 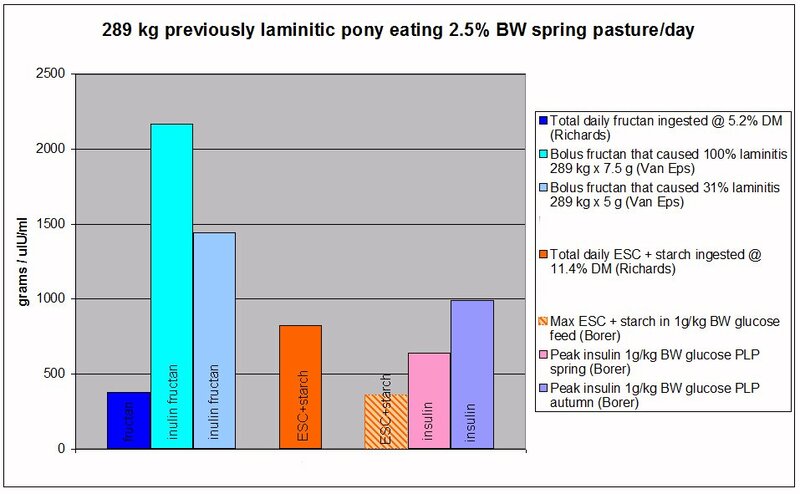 Orange is the amount of ESC (simple sugars) and starch he would eat per day on Richards' spring pasture - 9.9% DM ESC plus 1.5% DM starch x (289 kg x 2.5%). Hashed orange is the maximum ESC plus starch he ate in his experimental meal of 500 g Happy Hoof (10% WSC plus 4% starch - ESC not given), plus 1 g/kg bw glucose = 70 g (500 g x 14%) plus 289 g = 359 g ESC plus starch (which was mostly glucose). Pink is his peak insulin result following the Happy Hoof and 1g/kg bw glucose meal, in the spring. Mauve is his peak insulin result following the Happy Hoof and 1g/kg bw glucose meal, in the autumn, for comparison. Horses may be more insulin resistant in the autumn, perhaps to help them put on weight for the winter. Obviously, this is far from being a perfect comparison - apart from being hypothetical, there's likely to be little value in comparing natural grazing of fructan and sugar+starch over 24 hours with nasogastric bolus or bucket administration, but researchers have been using the nasogastric bolus administration of fructan as a potential model for naturally ingested fructan for years, so we would suggest our model is just as good! As you can see, even with our pony eating 2.5% of his bodyweight in spring grass per day, the fructan levels he's eating don't come anywhere near the amount of inulin (a short-chain fructan) given in one bolus by nasogastric tube, even at the lower rate of 5 g/kg bodyweight that caused laminitis in only 5 out of 16 horses experimentally. However, the amount of simple sugars (ESC) and starch he eats per day is more than double that which, when given in a single bucket feed, caused insulin to rise to over 500 uIU/ml in the spring, and nearly 1000 uIU/ml in the autumn. The minimum level of insulin that causes laminitis isn't known, but Melody de Laat found lamellar pathology in all horses that had experimentally induced insulin levels of around 200 uIU/ml for 48 hours, and Walsh et al 2009 found that the onset of laminitis was associated with hyperinsulinaemia > 100 uIU/ml. Gives figures for monosaccharides, sucrose & fructans as well as WSC total. Effects of high and moderate non-structural carbohydrate hay on insulin, glucose, triglyceride, and leptin concentrations in overweight Arabian geldings. Shepherd ML, Pleasant RS, Crisman MV, Werre SR, Milton SC, Swecker WS Jr.
"The objective of this study was to determine the effects of high and moderate non-structural carbohydrates (NSC) hay on insulin, glucose, triglyceride, and leptin concentrations in overweight Arabian geldings. 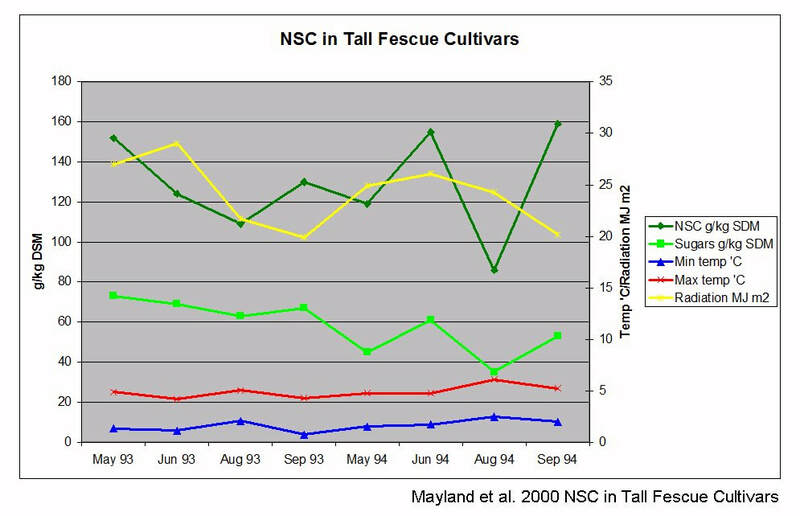 Eight adult overweight (average BCS 7 [9-point scale]) Arabian geldings were fed each of two orchardgrass hays, high NSC (18% DM) and moderate NSC (12% DM), in a cross over design during two 28-day periods. Body weight and body condition score assessment along with blood sampling to measure insulin, glucose, leptin, and triglyceride concentrations were performed on days 0, 7, 14, 21 and 28 of each period. Effects of hay, period, day, and day*hay on plasma glucose and serum leptin were not detected. Serum insulin was influenced by hay (p = 0.001), day (p = 0.03), and day*hay (p = 0.04). Insulin concentrations were higher on day 7 in the high NSC group (15.6 μIU/ml) than the moderate NSC group (9.5 μIU/ml), but not by day 14 (p = 0.0007). Plasma triglyceride was influenced by period (p = 0.0003), day*period (p < 0.0001), and day*hay (p = 0.02). Hyperinsulinaemia was not observed in the overweight Arabian geldings fed either a moderate or high NSC hay." The horses presumably weren't insulin resistant (insulin 15.6 and 9.5 uIU/ml). "Plants accumulate sugars during the day and use them up at night". found the highest concentrations of NSC in forages cut late in the afternoon. 8 Tall Fescue cultivars, grown in Kimberley, Idaho, 42'30 N, 114'08 W, elevation 1200 m, were sampled between 8 and 9.30 am in 4 months during the growing season over 2 years. The grass was vegatively growing, samples were cut at 8 cm. The grass was topped to 8 cm and fertilized between samplings. NSC included starch, fructan, glucose, fructose, sucrose and other non-quantified soluble sugars. Total NSC ranged from 91 to 162 g/kg the first year and 68 to 192 g/kg the second year, with the lowest NSC recorded in August each year, when regrowth was slowest. Sucrose was the primary component of NSC. Monosaccharides and disaccharides accounted for an average of around 45% of NSC, with a range of 33 to 58%. 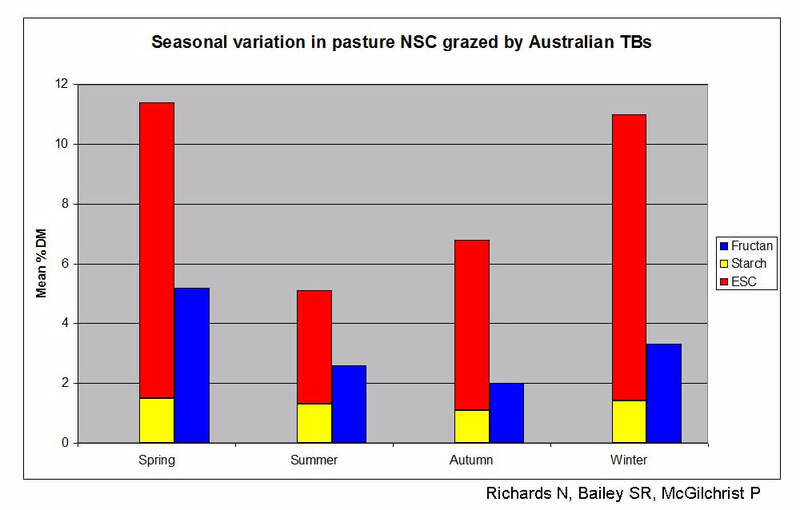 Cows were given free access to the different grasses and grazed the grasses with the highest NSC, and highest monosaccharides and disaccharides, the most, and in general grazed the grasses with the lowest NSC the least. had mean WSC of 12.6% on an as fed basis (range 6.2% - 20.2%), measured by the phenol-sulfuric method (Dubois et al. 1956). Estimating a DM content of 88%, this would be 11.09 % WSC on a DM basis. Starch, ESC, DE, DM not given. The effect of 1. conservation method (hay, haylage, silage); 2. using bacterial inoculants (in haylage and silage); 3. storage time; and 4. soaking was measured on WSC. WSC was the sum of glucose, fructose, sucrose and fructans were analysed using an enzymatic-spectrophotomectric method. Grass was harvested as silage @ 40% DM, haylage @ 60% DM and hay @ 84% DM. Silage had lower glucose, fructose and WSC than haylage and hay; hay had more sucrose and fructans than silage and haylage. Forages were sampled after 3, 6, 12 and 18 months storage - length of storage time did not affect WSC. Forages were soaked for 12 and 24 hours in water. Soaking for 12 hours reduced fructose and WSC in silage by ~50%. Soaking for 12 hours reduced glucose, fructose and WSC in haylage by ~50%, no further losses occurred after soaking for 24 hours. Soaking for 12 hours reduced glucose by 50%, fructose by 30%, sucrose by 85% and fructan by 60% in hay, with further losses of glucose after soaking for 24 hours. WSC was 24 g/kg DM in silage before soaking, and 38 g/kg DM in hay after soaking for 24 hours.